Eco Defense. Complete. Fruit Fly. Eliminator. ✓ ERADICATE FRUIT FLIES IN YOUR HOME - Eco Defense uses Natural ingredients to attract fruit flies away from contaminating your food and into our solution for fast and easy removal. ✓ EASY TO USE- No traps to set up. Just pour solution in and pour fruit flies out. Its that simple! TROUBLE SHOOTING STEPS: Not attracting fruit flies? Bowl is replaced with new solution every 48 hours. This will ensure the strongest scent for the flies to attract to. Place the bowl or multiple bowl of solution where flies are seen most. In larger kitchens more than one bowl may be needed. Be sure to close any entry points where flies may be entering such as windows. Fruit flies are still around? 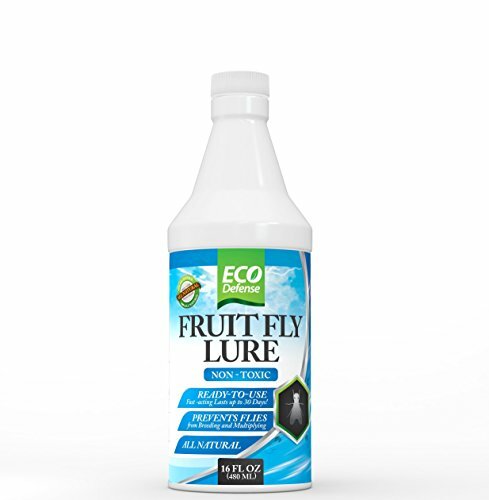 - Eco Defense Fruit Fly Lure is an attractant for fruit flies but cannot stop the problem completely unless The SOURCE of the fruit fly infestation is removed and handled. Fruit flies can are attracted to and can lay eggs on ripened fruits or vegetables, as well as drains, garbage disposals, empty bottles and cans, trash bags, or cleaning rags and mops. Ensure all of the following area are CLEAN and DRY. The following steps should ensure complete success. As always our customer support staff is available to answer any questions you may need. SAFE AROUND FOOD - Stop using chemical laden products around your food and family. Unlike other products on the market, our Fruit Fly Lure uses natural ingredients that are safe to use around your home, kitchen, restaurants, or wherever fruit flies have become a nuisance to you property. If you have any questions about this product by Eco Defense, contact us by completing and submitting the form below. If you are looking for a specif part number, please include it with your message.